The Raiders go on the road Sunday to play the Baltimore Ravens at 10 a.m. Here’s a breakdown by position. For the second straight week, the Raiders will face a rookie quarterback. Ravens coach John Harbaugh gave Lamar Jackson the nod Friday to start for a second consecutive game. Jackson had a memorable debut last week by rushing for 117 yards on 27 carries and throwing for 150. Derek Carr is coming off a game-winning drive against the Arizona Cardinals in Week 11. Carr hasn’t thrown an interception in the past five games. Unknown rookie Gus Edwards came out of nowhere last week to take control of the Ravens’ running back duties. Edwards recorded 115 rushing yards on 17 carries, nine more than Alex Collins and Javorius Allen combined. Baltimore would be smart to continue riding the hot hand of Edwards. The Raiders had success with the three-back committee of Doug Martin, Jalen Richard and DeAndre Washington versus the Cardinals. Ravens wide receiver Michael Crabtree will be playing against his former teammates. Crabtree played three season for the Raiders before joining the Ravens this year. Rookie Marcell Ateman stepped up last week for the Raiders. He had a clutch 32-yard reception to set up the Raiders’ game-winning field goal. Las Vegas native Ronnie Stanley has flourished into one of the top left tackles in the league. Stanley played with an injured ankle in Week 11 for the Ravens. Ravens right guard Marshal Yanda is a former six-time Pro Bowler. Raiders rookie left tackle Kolton Miller re-injured his right knee last week. The Ravens’ defensive line is led by 16th-year veteran Terrell Suggs. Baltimore has recorded 29 sacks this season, 20 more than the Raiders. It’s been a forgetful season for the Raiders’ defensive line, but rookie defensive tackle Maurice Hurst continues to get better. C.J. Mosley is the catalyst for one of the best rushing defenses in the NFL. 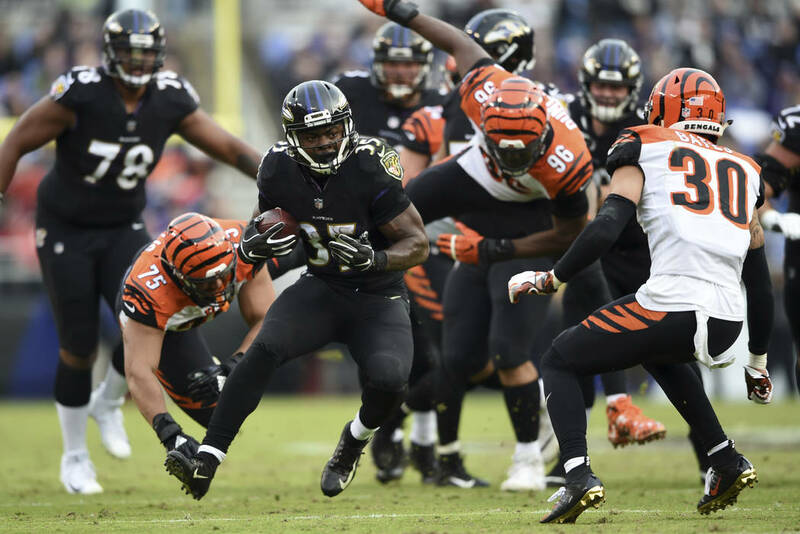 The Ravens only allow 94.6 rushing yards per game, the third best average entering Thursday. Raiders’ Marquel Lee had a solid out versus the Cardinals. The Ravens have one of the best cornerback trios in Jimmy Smith, Marlon Humphrey and Brandon Carr. Ravens’ safety Eric Weddle patrols the center of the field. The Raiders’ secondary has limited the big plays during the past two games. Ravens’ Justin Tucker, one of the best kickers in the NFL, has made 19 out of his 21 field goal attempts. Rookie kicker Daniel Carlson was cut from the Minnesota Vikings earlier this season for not making a game-winning field goal. He got the job done for the Raiders last week with the game-winning 35-yard field goal. Carlson drilled three field goals versus the Cardinals. The Raiders’ locker room was oozing with confidence after their second victory of the season last week. They could carry that momentum into Baltimore with nothing to lose. The Ravens have all the pressure, as they battle for a wildcard spot.